Teaching the world to tie knots since 1993! For over 25 years NetKnots has provided helpful information about fishing knots and rope knots with easy to follow step by step knot tying illustrations and animations for tying over 180 of the most popular and most useful knots. We continually update the site with new additions and more knot tying tutorials so bookmark us and check back often! The Fishing Knots section contains the most fishing knots on the internet and they are clearly displayed in sections by type for Loops or Line to Line knots and Terminal Tackle, and also as selections for beginners, fly fishing, salt water, even Tenkara! 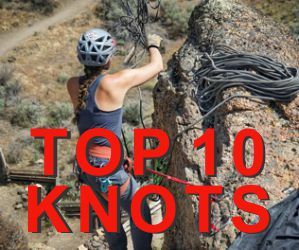 The Rope Knots section includes handy selections of camping knots and knots for boating, climbing, arborist, search and rescue, survival and other outdoor pursuits. All of our knots are clearly illustrated with step by step instructions and animated for you to sit back and watch. You can pause and rewind the animation while you practice tying for yourself. It makes learning easy and fun! New additions to the site include a Fashion Section for Neckties, Scarfs and even Pocket Square folds. And if you are a fly fisherman or woman, don't miss our new Fly Tying section! We have fly tying instruction videos by some of the biggest names in fly tying such as the late, great Shane Stalcup and some super fish-catching patterns. than to half-learn all of the knots. Thanks for making us the go-to tying resource of the internet for over twenty five years - Enjoy! NetKnots has the most extensive library on the internet! Over 65 fishing knots - from the Alberto to the World's Fair and everything in between. Over 90 knots to chose from, from the Alpine Coil to the Zeppelin Bend, you should be able to find it here and learn to tie it right.